Benefiting Beings for Countless Generations. Your support of the tax-deductible Gompa Building Fund will benefit countless beings for as long as the Dharma is taught at Langri Tangpa Centre. You are contributing to the happiness of the many students and visitors who attend class. You are also contributing to the happiness of their families, workmates, their community, and ultimately the world. And the happiness you are facilitating is not the fleeting and ephemeral pleasure of worldly life, but the long-term peace and pacification of the hearts and minds of human beings along with everyone they come into contact with. Help us pay off our mortgage by 2022, our 40th anniversary! Giving the means to end suffering – that’s what Langri Tangpa Centre is all about. Supreme generosity is about more than alleviating problems, it’s about showing the way to become free from problems forever. 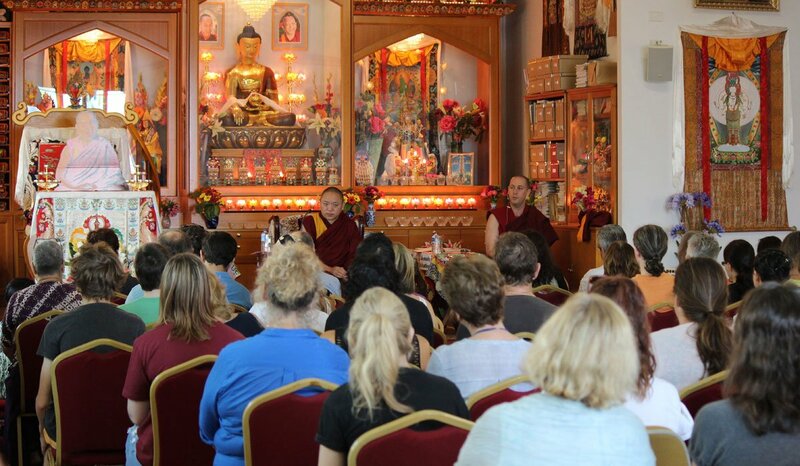 The Dharma – the Buddha’s medicine for the mind – is our method out of suffering, and Langri Tangpa Centre seeks to share the Dharma to offer the very best help we can to all the people that come here. There are many organisations doing superb work to alleviate the physical and mental suffering of human beings, but very few tackle the root cause of all these problems, or show how we can overcome them once and for all. By supporting Langri Tangpa Centre you are supporting the supreme method to liberate sentient beings, and complimenting the work that many charities and non-profits are doing to bring health and happiness to the world. Offering gifts and services in kind is greatly appreciated. If you would like to remember us in your will, to donate real estate, or can offer professional services pro bono, you can start the conversation by emailing our Director, and she will be more than happy to sit down for a chat and provide you with whatever information you need. Set up a regular tax-deductible donation on GiveNow, the secure, online portal used by thousands of Australian charities and non-profits. it's easy to set up, and they automatically send you tax receipts and an end-of-financial-year statement for your records. We need merit as much as we need funds! Help us with merit-raising, to create the substantial causes by reciting sutras and other practices. Let us know when you complete a recitation so we can add it to our ``Golden Book`` at LTC, and the world-wide map.